We’d love your help. Let us know what’s wrong with this preview of THE EMPTY WORLD by Andrew Reeves. and when it does, there will be another. Could it be connected to his parents’ disappearance? ... where he stumbles into a hidden research facility, where a team of renegade scientists headed by Danny's father have succeeded in creating a carbon copy of Planet Earth. But Danny's father is nowhere to be found, and enemies are striving to bring the Project down, to utilise his father's discoveries for a darker purpose, one which threatens the future of humanity. "Reeves has set the groundwork for a world children will love to return to again and again in later books... a creative reimagining of children's science fiction... clean and adventurous... the premise is enormously imaginative..."
To ask other readers questions about THE EMPTY WORLD, please sign up. For young Danny Ringrose, life is not easy. When his father, a discredited scientist and his mother disappear, his life changed. Left behind when his sister, he tries to make sense of the world without them, finding mystery in the secretive construction site next door to his home. Driven to explore the mystery, he discovers greater mysteries that opened a doorway to a new world of adventure with technology unlike anything he could have experienced on this world. The book is a wonderful tale of a y For young Danny Ringrose, life is not easy. When his father, a discredited scientist and his mother disappear, his life changed. Left behind when his sister, he tries to make sense of the world without them, finding mystery in the secretive construction site next door to his home. The book is a wonderful tale of a young boy and the extraordinary challenges that mature him as he searches for his mother in an unknown world. He meets with danger, betrayal, and no small number of shocking turns as he struggles to recover the family he lost. 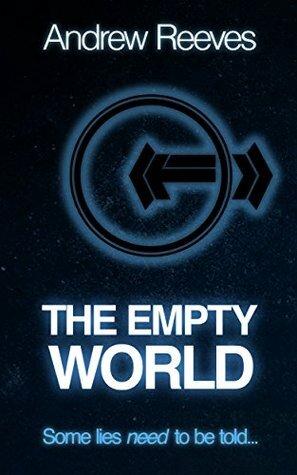 "The Empty World” is a thrilling, fast-paced YA sci-fi novel with some rather grown-up truths. It is totally appropriate for young adults, whose parents are concerned about sensitive content. The story emphasizes courage, raises environmental awareness, and promotes science and knowledge as "super-powers." After all, the characters of the book who cloned the entire Universe are bound to be viewed as super-heroes, and science made it possible. Plot: The story is fast-paced and intriguing, with a rather unique premise. The author claims that some of his science ideas came from the teachings of Dr. Michio Kaku, a great science mind and visionary of today. Just like the futuristic predictions of Dr. Kaku, the science premise of "The Empty World" is daring and unbelievable. Although the extent to which the author utilizes actual science ideas is minimal, he explores these ideas to the depth, creating a believable universe. The story takes place not only on Earth, but also on a cloned Earth, where the dangers are unique and threatening. Poisonous atmosphere, almost alien terrain, fog that disables equipment and kills people … All these dangers will keep you turning pages. Characters: The characters are easy to identify with for thirteen to fifteen year olds, whose impressionable minds will have no problem keeping up with a premise so audacious that you surely expect the characters to never get out of it all in one piece. The novel has a perfect YA protagonist, fourteen-year-old Danny Ringrose, who is solving the mystery of his parent’s disappearance, while going through some strange physical changes. These changes scare and intrigue him, and at times, make him feel like someone else. Danny is an average kid, with very unusual parents, and surrounded by even more unusual circumstances. Jayney, Danny’s younger sister, is also an enjoyable character. She is witty and clever beyond her age, and a real strong female character in the making. Jayney also experiences physical changes, but she has even less time to adapt to them, and takes every change and danger in her stride. Robert Ringrose is a character whose decisions are either hit or miss, especially when it comes to his children and wife. His heart is in the right place. He is driven with the dream to save humanity, but his ambitions almost always put his loved ones in second place, to the extent that he even calls them "a product with a purpose." Robert brings up all kinds of antagonistic emotions in his son, and rightfully so. Is he worthy of redemption? I guess it’s for the reader to decide. Rasmus Creece is a wolf in sheep’s clothing, who by the end of the novel, goes so terribly rogue that even his accomplices turn away from him. The scope of his betrayal earns him the title of the ultimate villain. Writing: The novel is well written and well edited, with no meandering or long expositions to slow down the reader. The author has a keen sense of humor and introduces it consistently with the characters. For example, the bully-kids at Danny’s school hilariously mispronounce his name as Ringworm (not Ringrose). The joke gets the best mileage when Danny’s teacher also slips and calls him with this nasty nickname. The novel is highly recommended for young adults. It will definitely keep them out of trouble for a while, at least for as long as they turn the pages. " The Empty World' by Andrew Reeves is a well written fantasy / science fiction mystery which will have great appeal for younger readers. It started of reminiscent of a Famous Five adventure story and turned into something much bigger and very rewarding. The child in me enjoyed it as much as the adult. Imaginative, inventive and very entertaining, this looks like the beginning of a successful and enjoyable series. Very well done. What a great story! Welcome to a new teenage hero, Daniel! This is an exciting, well written science fiction tale that will hold the interest of both young and old alike. I personally loved it, although some of the science was a bit beyond me. Definitely worthy of five stars, it had me in it's spell until the end. Now I want to know what happens next???????? UK-based writer Andrew Reeves aims to inspire his readers with stories they won't forget. In his pursuit to be creative, Andrew is many things: author, screenwriter, poet, composer, songwriter, musician, designer, cartoon illustrator and proofreader to name a few. In addition to novel writing, Andrew has written several screenplays and short stories of varying genres, including tales for younger r UK-based writer Andrew Reeves aims to inspire his readers with stories they won't forget. In his pursuit to be creative, Andrew is many things: author, screenwriter, poet, composer, songwriter, musician, designer, cartoon illustrator and proofreader to name a few. In addition to novel writing, Andrew has written several screenplays and short stories of varying genres, including tales for younger readers, and has proudly co-created over 3,600 silly words with crazy definitions, compiled as a nonsense dictionary which he and a fellow co-writer hope will very soon see the light of day. Andrew also spent a handful of years designing downloadable multiplayer levels for Star Wars PC game Jedi Academy under his pseudonym of Several Sided Sid, faithfully re-creating iconic scenes from the movies and creating brand new environments for the gaming world to explore and use as skirmish arenas for online battles. Andrew's original creative love has always been his writing, and it's the pen he wields now instead of the sword (hey, it's mightier). Andrew recently had his short comedy sketch The Wall printed in the inaugural issue of Scaffolding Literary Magazine, published by Jalapeño Publishing, and is thrilled to say his tiny little fairytale screenplay THE LEGEND OF STONY BOB AND STONY BILL achieved Semi Finalist position at the Shortcut 100 Chicago Short Film Festival 2017. He is currently hoping to take his Legend to the big screen! Andrew is the author of two books currently, with many more on the way! THE VOODOO DOLL: THE PRIESTESS AND THE PLEASURE tells the story of a traveller who becomes enslaved by an ancient doll who commands a group of girls dancing on a secret beach, and his struggle to overcomes its ancient evil. He is also more notably the author of YA Sci-Fi novel THE EMPTY WORLD, which begins the adventures of fourteen-year-old Danny Ringrose, whose father Robert is a renowned scientist who has cracked the secret of cloning stones and created a carbon copy of Planet Earth in a manmade parallel universe, as an intended home for Mankind, once our current home world will no longer be able to support us. Yet Danny's father's benefactor is evil megalomaniac Rasmus Creece, who has been secretly shadowing all of Robert's work, re-engineering it to create a frightening contraption known as the Big Bang Machine.